‘Johnny Favourite’ was a David Holmes release on the Warp label in 1994, a clanking, 15 minute descent. The title was a nod to Mickey Rourke in the film Angel Heart, a private investigator hired to find the elusive entertainer Johnny Liebling. The journey took Rourke to New Orleans, where he encountered blood and bad magic, lashing him into a voodoo loop, a Faustian buy-out. At the end of the film, Lucifer repossessed his soul and the elevator took him on a terminal ride to Hell. Looking back, you can see that Holmes has been a consistent myth-maker, using music to underscore and overload, to suggest and inspire. Likewise he has used archetypal figures to rich effect; the fortune teller, the trickster, the lost soul, the searcher and the labyrinth. ‘Let’s Get Killed’, his 1997 journey through the fever of a New York night was the stuff of Orpheus, redeemed by ‘Don’t Die Just Yet’ and the option to exit the darkness. But David has often returned to this story. His 2015 film I Am Here was a lyrical call to his deceased brother Michael, following his spirit trail through confusion and anxiety, finally re-connecting with the ancestral source in a version of Tír na nÓg, the Celtic realm of the other. 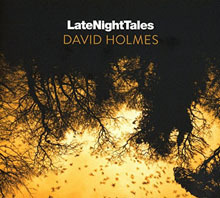 ‘Late Night Tales: David Holmes’ stays true to this impulse. There is original, astonishing music. Friends have been encouraged to provide new works. Thirdly, David infuses the experience with selections by the likes of David Crosby, The Children Of Sunshine and Buddy Holly – who sounds spectral and gone on ‘Love Is Strange’. The twilight aspect suits the lesser-known selections. Barry Woolnough’s ‘Great Father Spirit In The Sky’ was recently issued by Andrew Weatherall on his Moine Dubh label. It sounds like Peter La Farge, sometime mystic of Greenwich Village and it opens the record fine. Later, Spark Sparkle references Edward Lear on ‘Slythtovery’ but the mood recalls those midnight wanderings of Bowie and Iggy through the Turkish quarter of Neuköln, Berlin. ‘Henry McCullough’ is a homage recorded by BP Fallon and David on the day of the guitarist’s funeral. Beep was frequently there as a scenester, reporter and Zelig and thus he declaims about Henry’s collisions with Hendrix, Woodstock, Wings and the shuddering demands of a pioneering life. It has meaning and wonder. ‘Late Night Tales: David Holmes’ asks you to submit to the author’s flow, to allow the subconscious to be touched. It involves lullabies and drones, spikes of insight and emotion and then an outstanding finish. Seamus Heaney’s posthumous collection was a translation from Book VI of Virgil’s The Aeneid. In this, the Trojan warrior is lost and grieving for his father Anchises. So, the exiled hero makes his way into the underworld to meet his dad and to receive a vision. The encounter is joyous on both sides. But there is grief also. The son and the father try to embrace three times, but this intimacy is denied between the living and the dead. Stephen Rea reads the poem, quietly wise to Heaney’s translation and his Irish inflections. The music is supplied by David and Jon Hopkins, a musical experiment they began in a previous decade which has now found an immense expression. It gives you sorrow and also solace. You resolve to dream it again.